Making garden art is one of my favourite things to do. It’s such fun, and the possibilities are really endless. 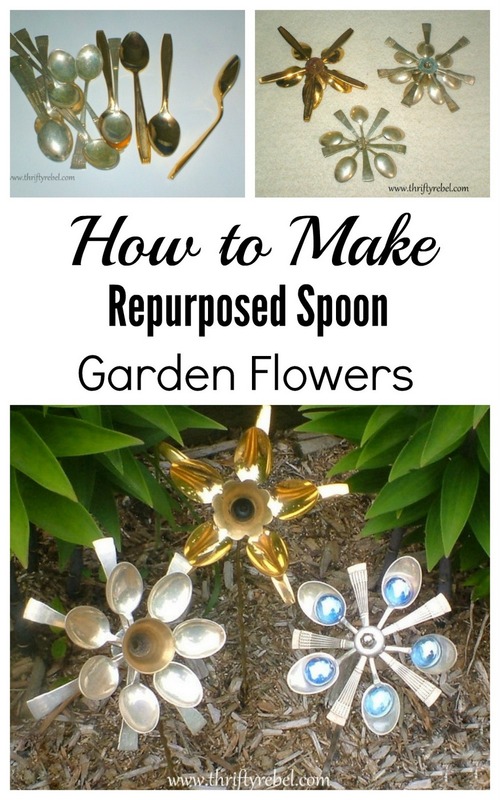 Today I’m sharing how I made decorative cutlery flowers using thrifted spoons. 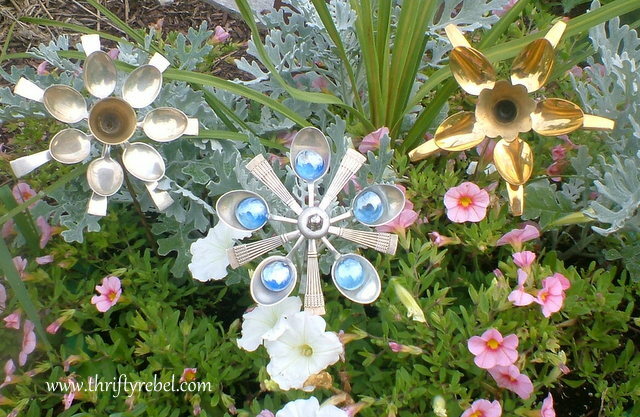 When I made my garden plate flowers last summer I thought it would be fun to make smaller flowers using cutlery, but I thought I didn’t have any suitable small spoons at the time. 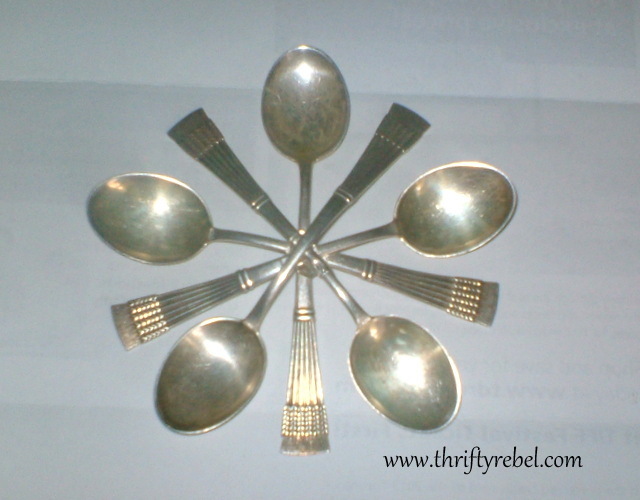 When I did my craft room makeover last winter I discovered a set of five 14 karat gold plated spoons, and a set of twelve silver spoons. I’d thrifted these small spoons years ago, put them away, and completely forgot about them. Here’s how I made two of the flowers. 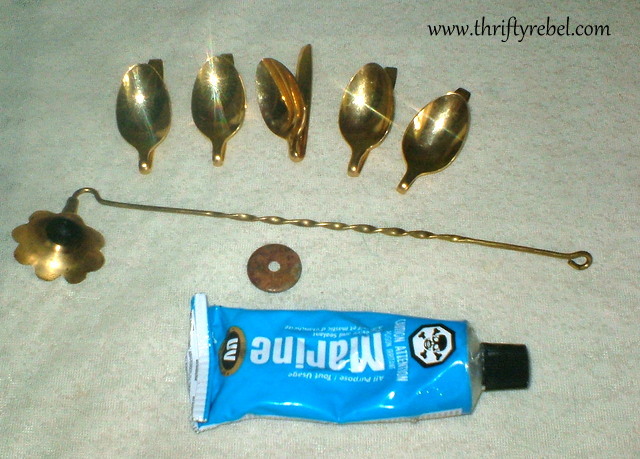 All I needed was a large enough washer (size depends on the size of the spoons being used), a vintage candle snuffer with a handle that unscrews (I have a small collection of these that I thrifted as a bunch for 50 cents each), and Marine Goop adhesive. Marine Goop is very strong so it should only be used in a well ventilated area. I had the windows open in my craft room when I was doing this. After I bent the spoon handles back I glued the spoons to the top of the washer at the neck and held them in place using whatever craft supply bottles I had around. This was just so the spoons wouldn’t move while the glue was drying. I did a dry fit to make sure that my unscrewed candle snuffer head would fit into the space in the middle of the spoons, and then I left the spoons like this for about 24 hours to cure so they were super secure. Once the spoons were solidly in place I glued the snuffer head into that middle spot by carefully applying glue to is sides, making sure not to cover the hole in the back where the stem screws in. Then I left it at this stage for another 24 hours. 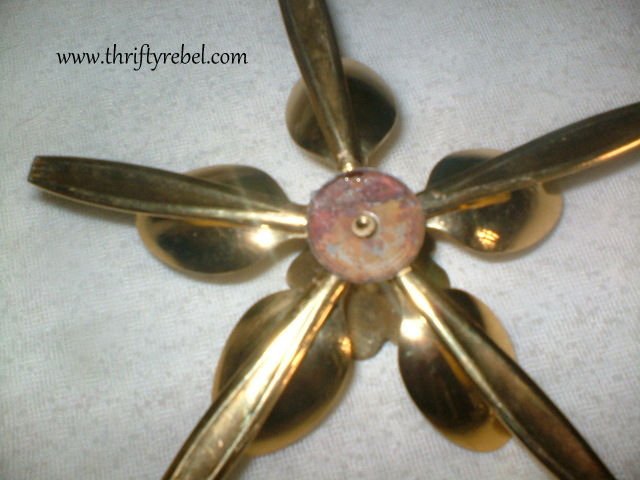 Here you can see the hole in the bottom of the snuffer head through the hole in the washer. Here are the two flowers with their candle snuffer centres after they’re super cured and with the snuffer stems reattached. 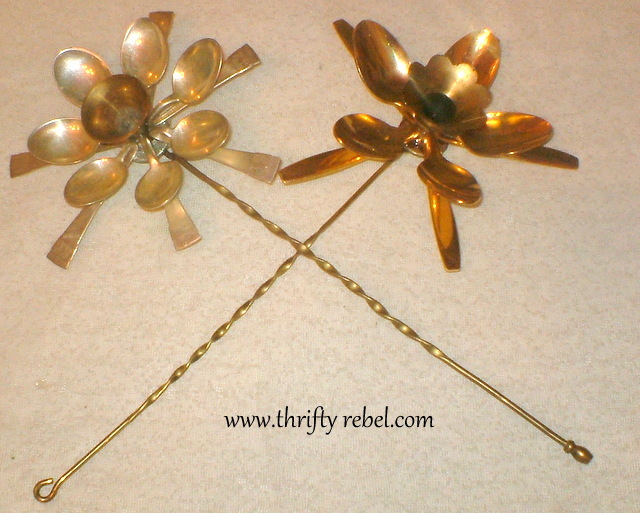 The silver one is made the exact same way as the gold one, but with a slightly different gold toned candle snuffer. The stems can be removed for easy storage over the winter. I only needed seven of the silver spoons for the silver flower above so I decided to use the other five to make a different flower, which I made at the same time. For this one I used a silver washer, a nut thingy, and five blue glass agate beads. I glued the spoons together in the middle just in a way that I liked. I had to bend some of the spoons in their middles a bit to get them over each spoon as I went. I let this cure over night with the other two spoon flowers. Then I went to the dollar store to see if I could find anything to use as a stem and I found a set of four metal skewers. 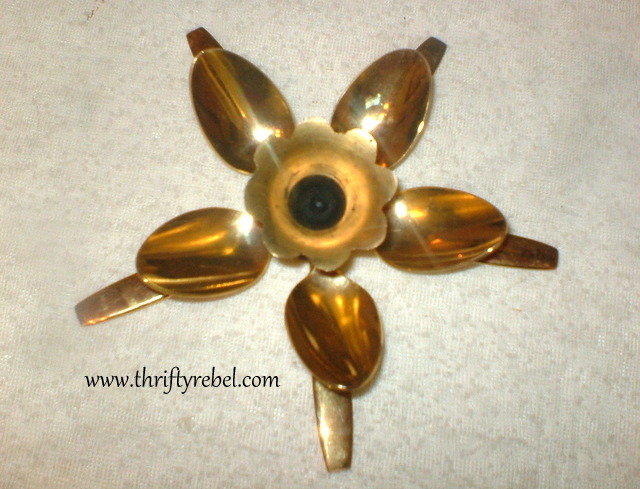 I bent the rounded top with pliers to straighten it out and glued it to the back of the flower, securing it with whatever I had around to hold it in place as it cured. I bent the skewer a bit so my flower wouldn’t sit perfectly straight. 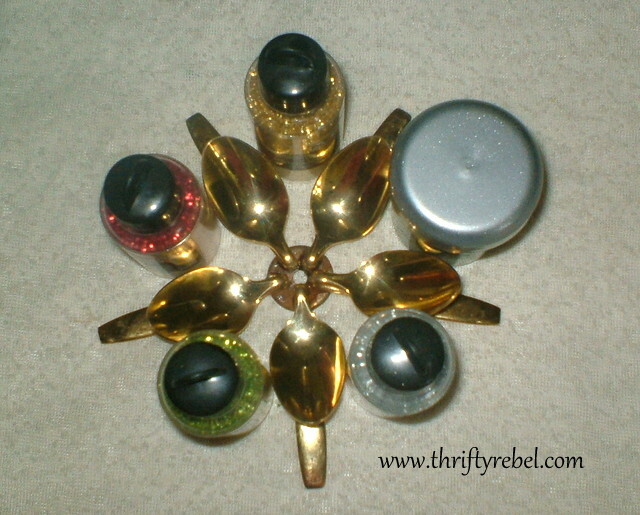 I did the same with the candle snuffer stems. 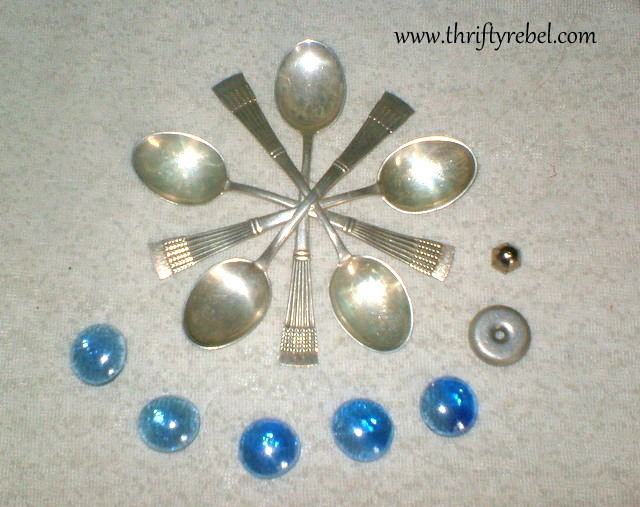 Once this spoon flower had cured I simply glued the blue glass beads onto the spoons, and glued the washer and nut thingy in the centre as you can see in the after pics. Here are the backs of my three flowers. And voila!! Here they are planted right in the garden around the back deck. And here they are planted among the flowers in a vintage metal sink in the garden by the pond. 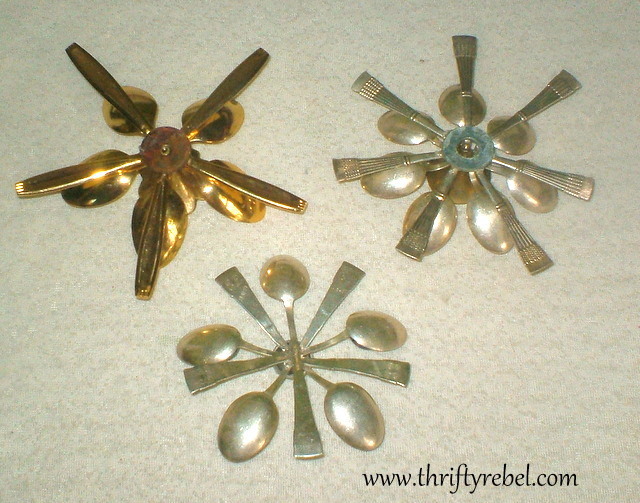 Making these cutlery flowers was not difficult at all. 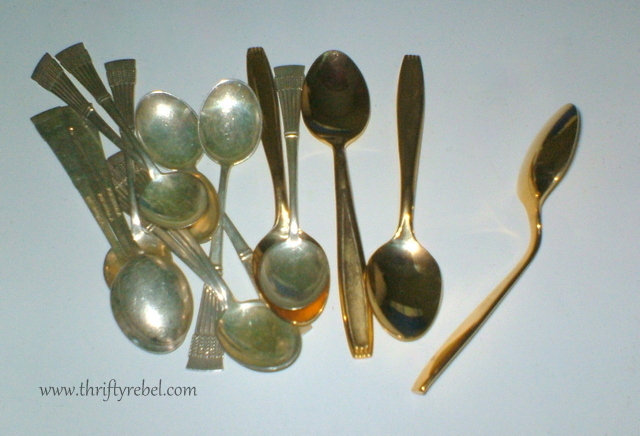 The small spoons were easy to bend where needed, especially the silver ones. The most challenging part was leaving them alone as they cured between the steps. The height of these flowers is perfect for small gardens or planters, but if more height is wanted copper tubing in the desired length (or some other type of narrow tubing) could be staked into the ground and then the stems of the flowers would just slip right in. Plant some flowers somewhere today (real or cutlery) … and smile! Very very clever and pretty! Oh Tuula…how do you come up with this stuff???!!! I love these! I wouldn't have thought of that in a million years. So pretty! What a clever way of using old spoons!!! These are so cute and adorable! Whaaaa???? I love these! You are so clever!! what a creative way to use those spoons. You really came up with a beautiful project. These are just so adorable. I make many things with spoons, but this is new to me. 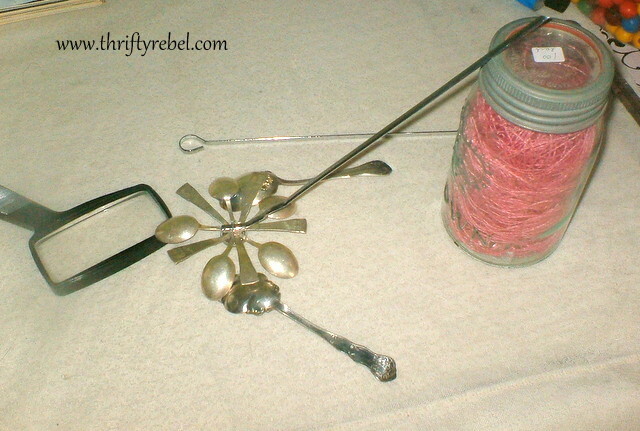 I have boxes filled with spoons so I am definitely going to make some of these. Oh Tuula, these are adorable! Very unique and eye-catching 🙂 Thanks for sharing with us. Where do I go to get Marine glue? What a novel idea. Thank you for sharing. Thanks Marfie! I found the Marine Goop at Wal Mart, but hardware/build-all type stores might carry it also. I hope that helps. Thanks so much for stopping by! I've honestly never been a fan of the cutlery flowers, but yours are the first I've seen that make me want some. I love them! Thank you so much for changing my stubborn mind. LOL! I love your spoon flowers! I have a large one that I got at The Country Living Fair. It is welded and I knew I could never make one. Thank you for showing me that I CAN make these! Pinning. Your spoon flowers are terrific!! I have used plastic spoons painted all colors for garden art projects but your idea is so much better. Please stop by and link up this great post at http://www.mypersonalaccent.com/the-peacock-strut-1/ as we launch our first Blog Strut, Peacock Style. 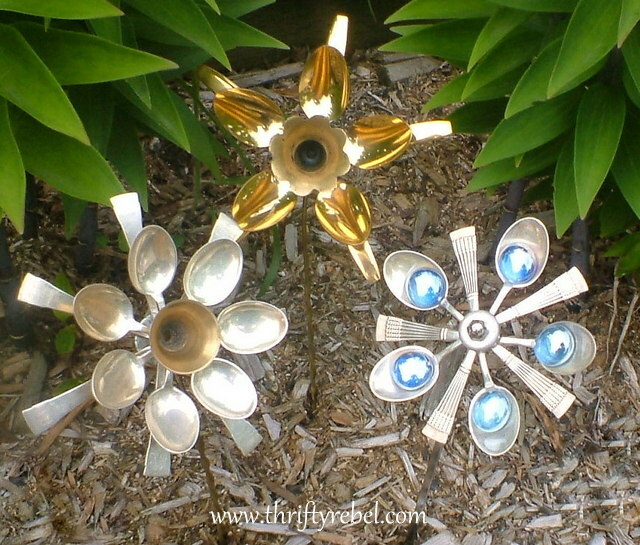 It is no wonder all silver cutlery has disappeared from the thrifts – you have posted another great garden art post! Love those flowers. They would make pretty garden ornaments all year long here. These are adorable! I love the way they look with your live plants in the garden. So whimsical, fun, and very creative. Great tutorial too. That is fabulous & genius! They are super cute flowers and make great garden decorations! What a great garden decoration. I love the daffodil. I am going to be hooked! I just finished the flower plates last week. Very creative Tuula. I've never seen flowers from cutlery like this before. Tuula! How cute! I love these flowers, great tutorial. thanks for linking up to catch as catch can! Catching you! Such a great idea, they are beautiful! I highlighted this post on my blog tonight!!! These are really wonderful! What a creative idea! I have pinned this post. These are awesome! What a terrific idea! I love bargain hunting too! I would love for you to share and link up at my weekly TGIF Link Party if you haven't already this week. Your favorite posts, most popular, recent or new! The party is open every Thursday night and closes Wednesday's at midnight. Followed by (Not SO) Wordless Wednesday! http://apeekintomyparadise.blogspot.com/. a gardener to boot, so this is a great project for me. With Christmas around the corner, it may just be the ticket for some gifts as well. Thanks so much! I have several ideas to use flatware for crafts, but I have trouble bending them. Could you please tell me how you do that? The spoons I used were very easy to bend, perhaps because they were small and the silver ones were pure silver, which is a soft metal. The gold plated spoons took a little more muscle on my part. If you have spoons that are very strong and hard to bend you could use a vice, which helps you to bend them. I don't have one myself, but I am hoping to find one at a garage sale or estate sale this summer. Some spoons are just harder to bend than others. Good like with your crafting. Working with cutlery is such fun! I Saw your Hometalk Post! Very nice work! Really cute idea. You’re so creative.